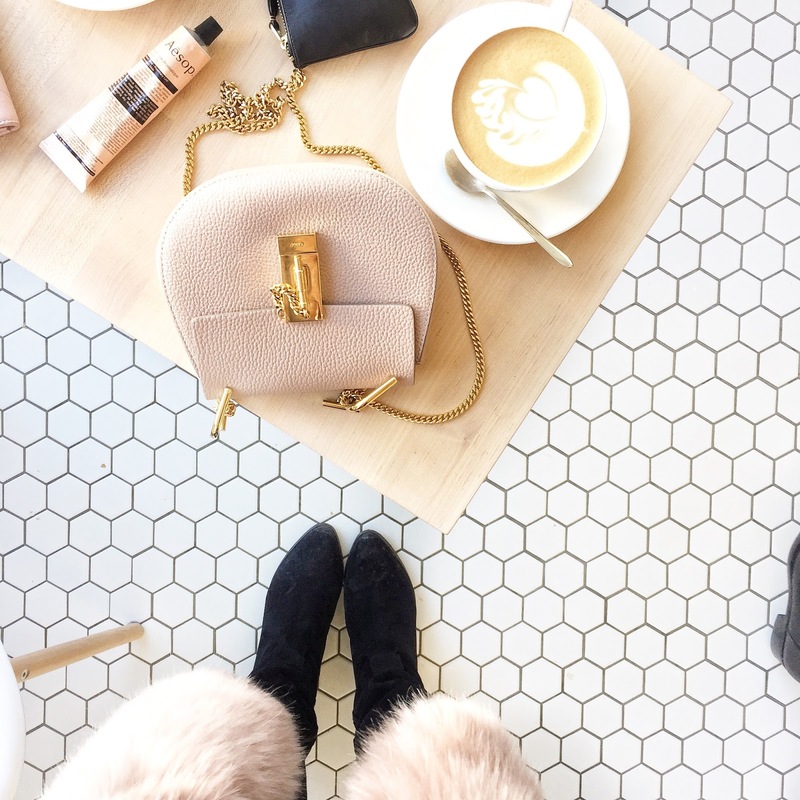 January 2017 | La Petite Noob | A Toronto-Based Fashion and Lifestyle Blog. Toronto has an incredible coffee culture. Cafés are a dime a dozen in these parts, and I feel as though I'm constantly discovering different spaces to enjoy my morning brew. While I have fun exploring the city in search of the perfect coffee spot, there's a select few that always keep me coming back. These places rank high for me on aesthetics, quality of coffee and friendliness of service - because let's face it, who actually enjoys aloof hipster attitude? 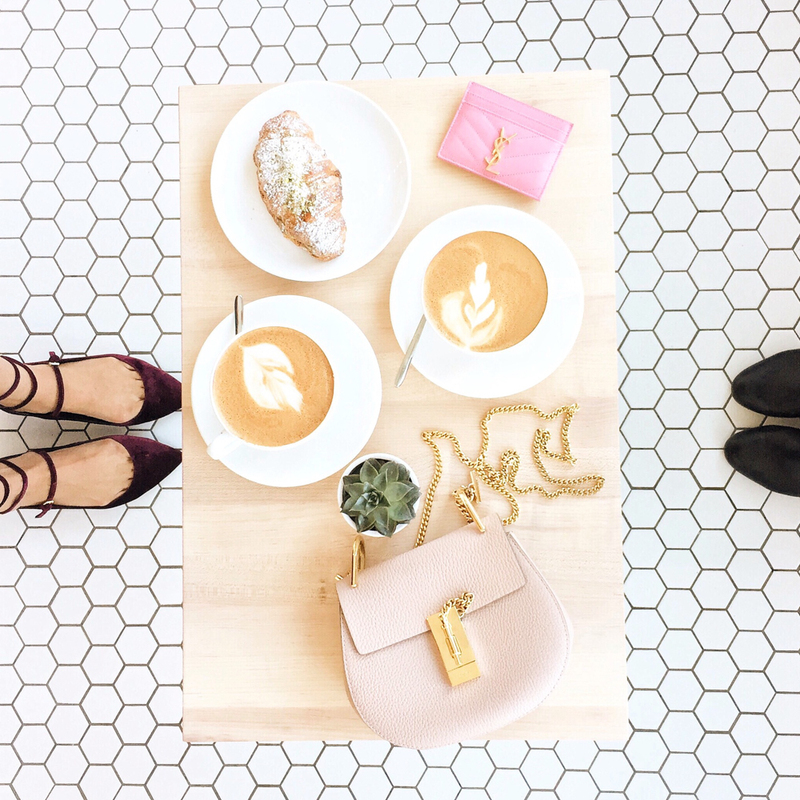 Here is my roundup of my favourite, most instagrammable cafes in Toronto. Dineen holds a special place in my heart, as it was one of the first cafés that drew me into coffee culture. Right on the edge of the financial district and close to the Toronto Eaton Centre, you can expect to be rubbing elbows with high-powered executives, tourists and coffee snobs alike at this gorgeous space. The café is absolutely breathtaking, and the energy is absolutely electric; don't expect quiet, or even a table in this place - it's usually packed. 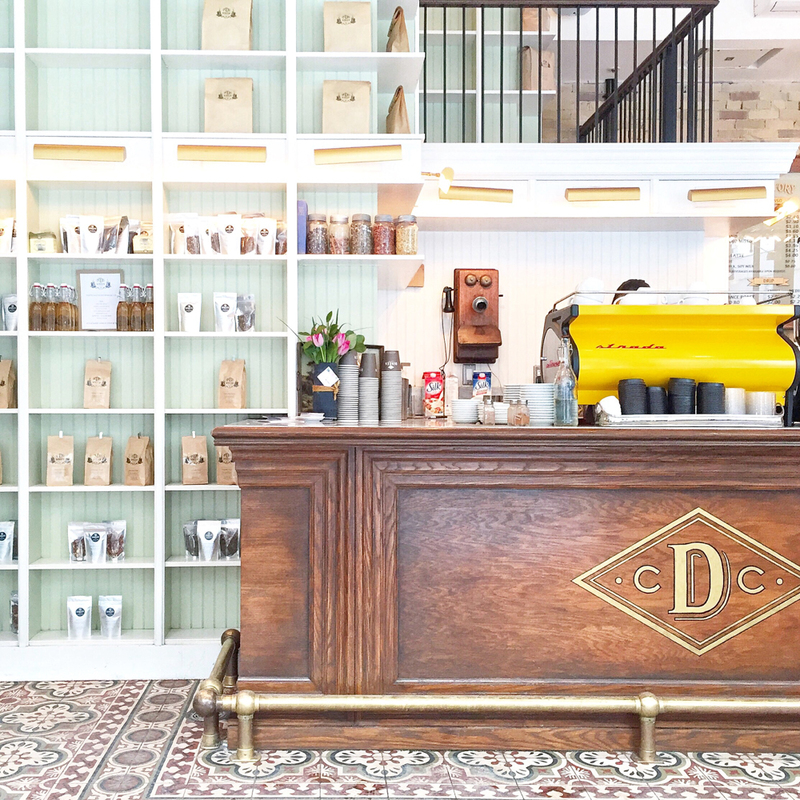 I always come back to Dineen Coffee Company to enjoy a lunch-time coffee and ogle their gorgeous tiles. Those of you who follow me on Instagram will recognize Hailed Coffee Company as one of my most frequented cafes in the city. The design of the beautiful café really speaks to my soul; lots of light, with beautifully minimal details and a tiled floor to boot! To make matters even more addicting, the staff is absolutely wonderful and Hailed offers lots of variety from your typical latte. 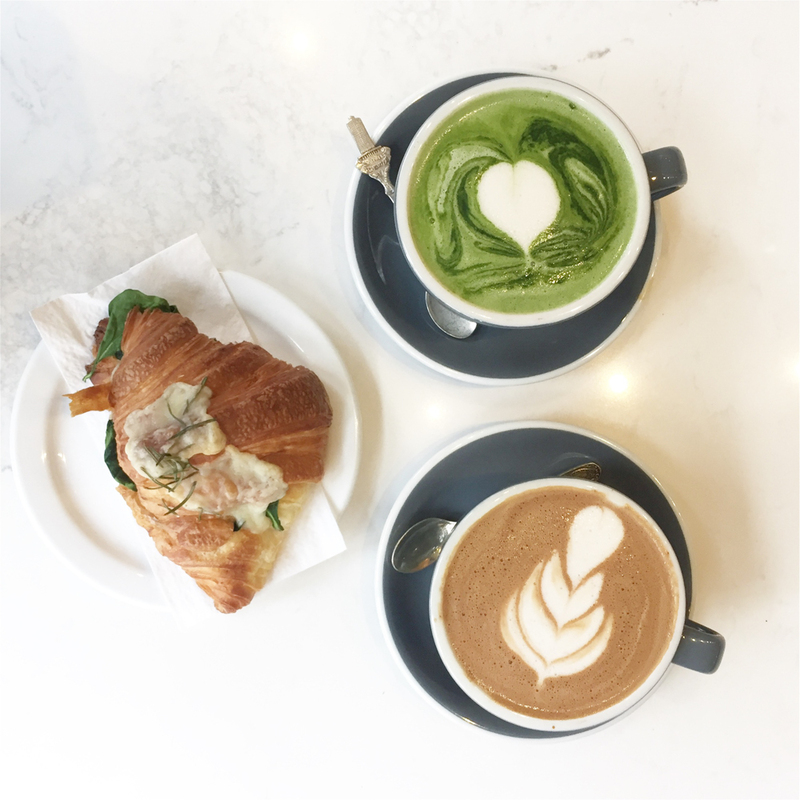 I love enjoying a matcha tea latte or one of their cardamon-infused espresso based drinks. 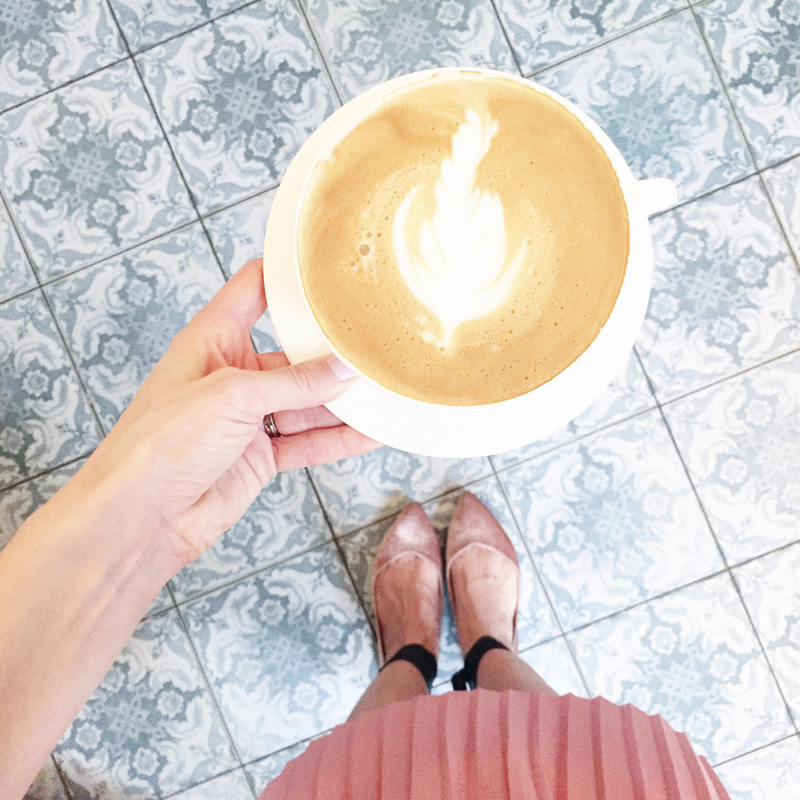 If you haven't visited Hailed Coffee in Toronto yet, don't think - just do it. 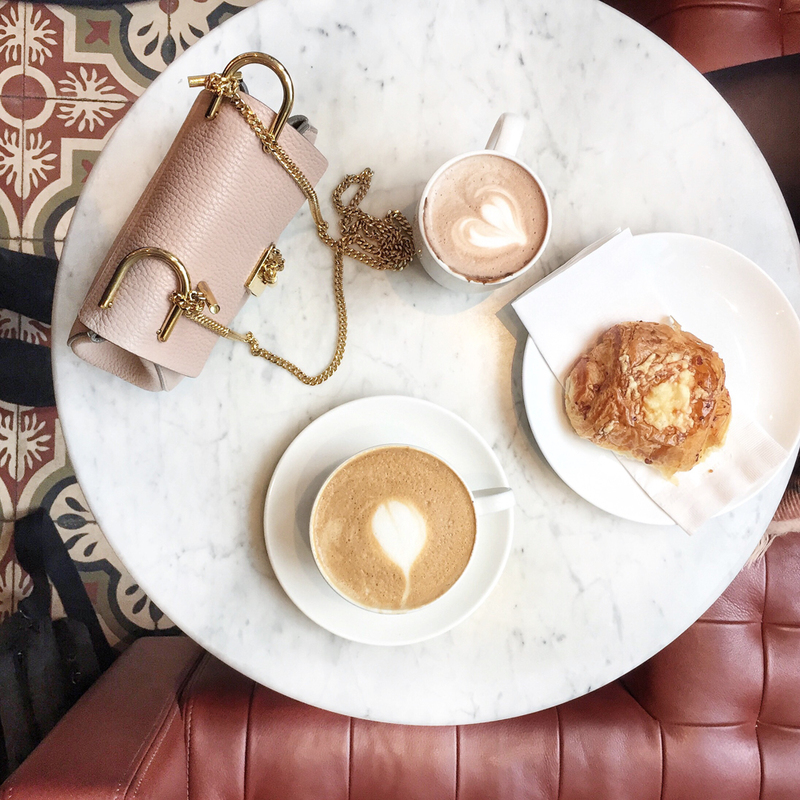 There are certain places that capture the heart of everyone within a particular group; for Toronto bloggers, Colette Grand Café is the mothership. With a design that invokes the most beautiful corners in Paris and plenty of light, it's easy to see why Colette is an industry favourite. I like to visit on a weekday when there are plenty of tables available for enjoying a latte with one of their famous macarons - weekends are reserved for dining room patrons only. I've only just visited The Walton within the last month with Rebeca and Sabrina, but I had to include them in my lists of favourites because I was so impressed by the service and warmth of the space. The Walton has the energy and feel of a cozy neighbourhood joint, with two tables encased in windows to enjoy your coffee and watch the world go by. The staff were amazing on our visit, and patiently waited as the girls and I exercised our own brand of crazy and picked out which china we wanted for our coffees from their vast collection. The Walton is one of those rare places in Toronto that make you feel comfortable to sit and chat all day - in fact, that's exactly what we did. Roosters Coffee House is a neighbourhood staple for me, and their friendly service is hands down what keeps me coming back. Rarely are you greeted with a warm 'hello' and genuine conversation in a big city like Toronto, but I have come to expect this sort of warm reception at Roosters. I also appreciate how Roosters strives to keep their prices low, making it one of the most affordable spots to get an espresso-based drink in Toronto. 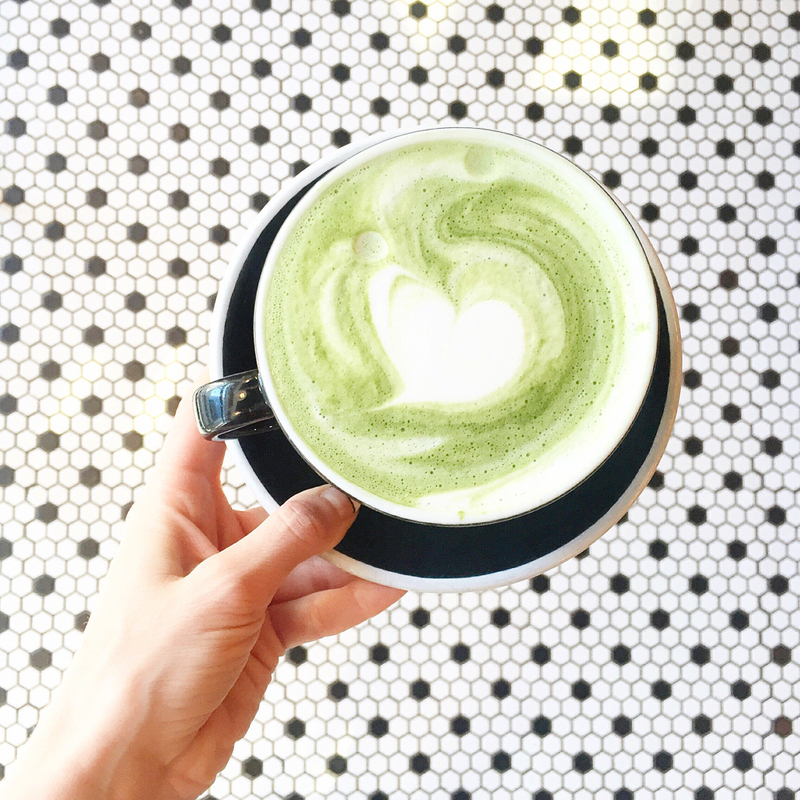 Heads up - they also do matcha lattes! Another neighbourhood coffee joint for me, I always come back to Neo Coffee Bar for their incredible matcha lattes. The space is beautifully industrial, and they make all of their treats in-house which means that you're often greeted by the smell of fresh baking when you walk through the doors - amazing! Neo also exercises consistently amazing latte art, so if you are in the market for a fancy coffee, this is your spot. Another new addition for me, I visited Safehouse with Tara and Sabrina and we were all blown away by the warm reception we received. The owners of Safehouse really care about making their space inviting, and their coffee is incredible! Can we also talk about these tiles; I'm a sucker for world-play in tiles and the cheeky tiled 'hi' captured my heart. While Calii Love is known for their poké and açai bowls, it's also one of my favourite places to get a coffee. Not only is the space an absolute dream, but I've really come to enjoy their coffee - I'm talking walking over 20 minutes out of my way just to get an americano with coconut milk! If you find yourself in the entertainment district, or wandering around King West then definitely give Calii Love a try - you won't regret it! That's it! 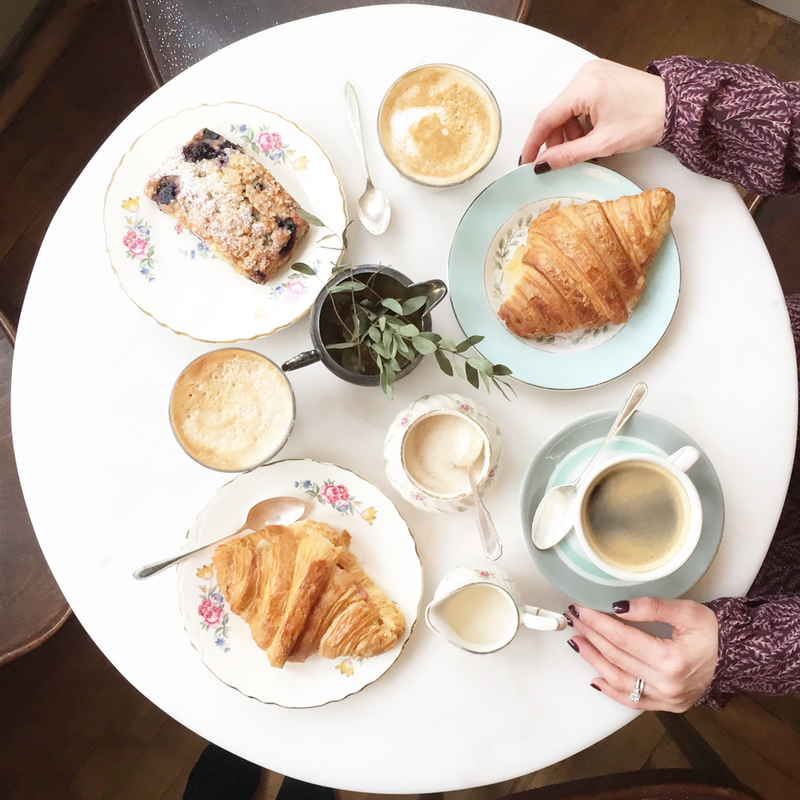 I tried to keep my list as concise as possible, but there are just so many amazing cafés in Toronto. Which cafés are your favourite? Does your city have a rich coffee culture? Let me know! I've been keeping a big secret for the last couple of months: I've been laid off from my job. Friday was the last day that I would be walking into the financial district in Toronto, to my desk, to my guaranteed source of income. While I've been grappling with many emotions since learning the news that I soon wouldn't have a job to go to, the one emotion that seems to be at the forefront has been hope. I'm hopeful that this is only the start of something amazing. Maybe this isn't simply losing a job; I'm hopeful that this will be my new beginning. Truth be told, I've been toying with the idea of becoming a full-time blogger for some time now. Even though my day-job was only part-time, I was still struggling to juggle work with blogging commitments. 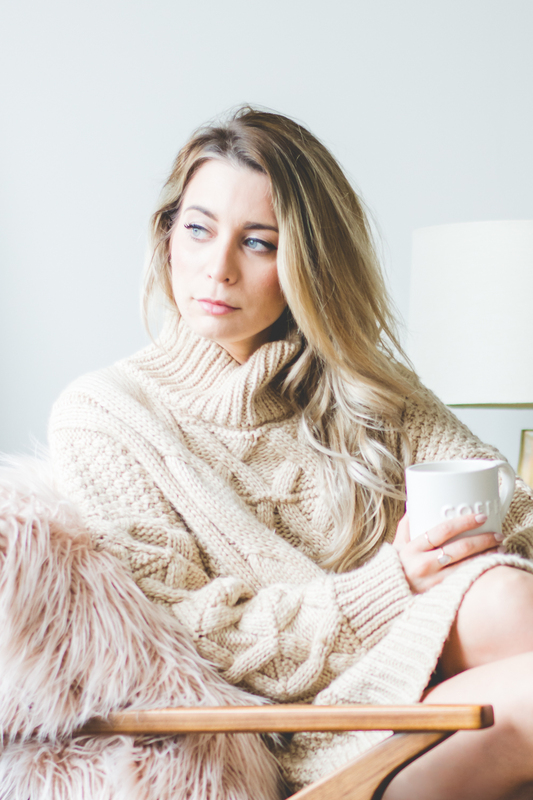 My diet suffered, my anxiety had really gotten the best of me and I was constantly feeling as though I was giving a B+ version of myself - both to my job and to the blog. Though I was just barely keeping my head above water, I still couldn't pull the trigger on dropping my day-job and moving to blogging full-time. It literally took someone else making a decision for me for anything to happen, but I'm choosing to see it as a sign from the universe. From here on out I will be pursuing blogging as a full-time engagement. I truly believe that everything happens for a reason. Take these beautiful rings from Bluboho for example. 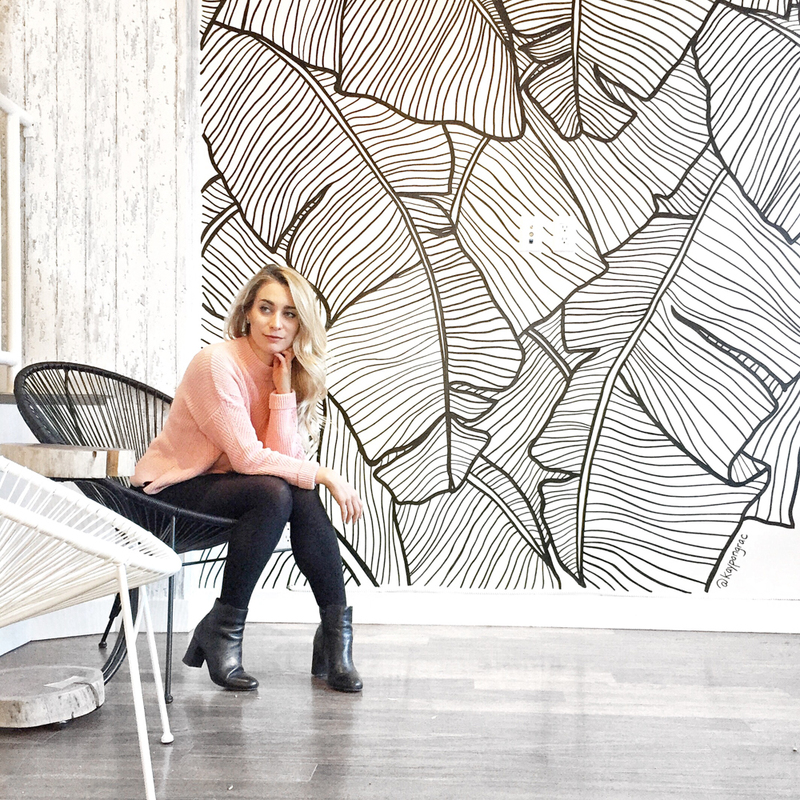 When I visited the Bluboho location on Queen Street in Toronto, I was greeted warmly by Cheryl and her amazing staff and started looking around at all of the dainty jewels. 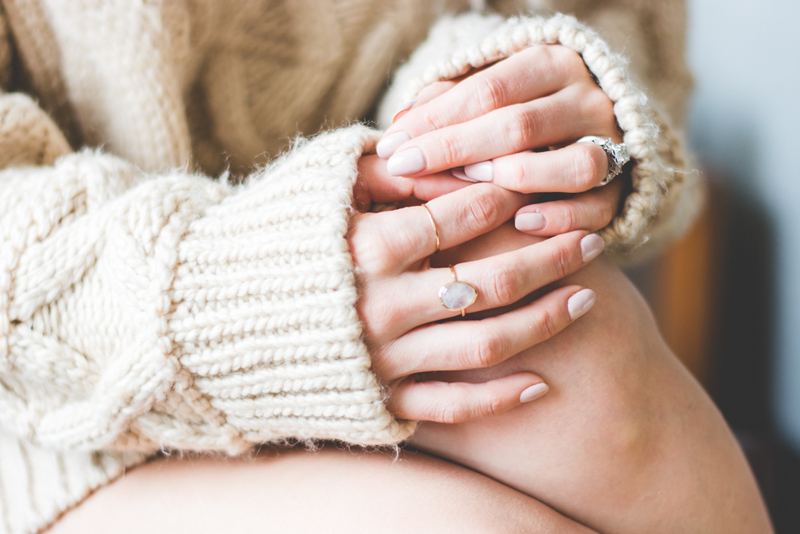 Immediately I was drawn to the moonstone ring - I just loved the beautiful white stone cased in delicate gold. 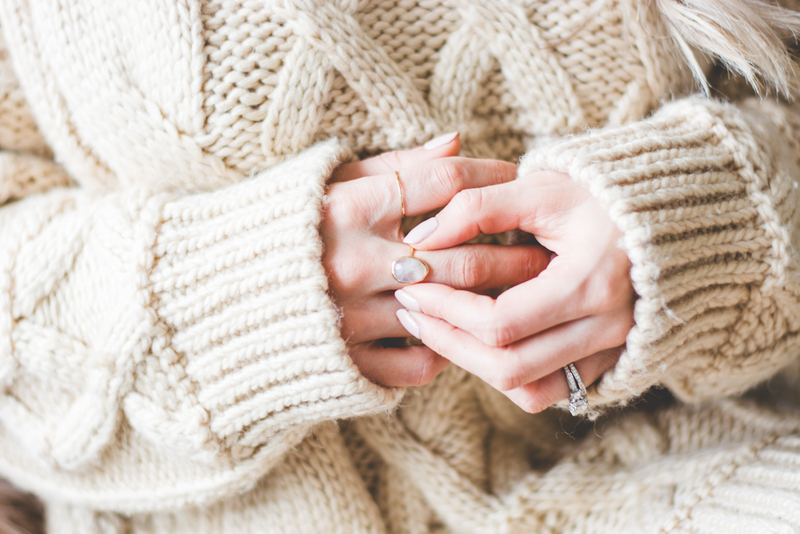 Once I learned that moonstone symbolized new beginnings, I was sold - it was so fitting! Cheryl even let me pick out my own moonstone and they customized a ring for me! I chose a stone with some cloudiness to remind myself that my new journey won't always be easy, but it will all add to the beauty of it in the end. It feels good to get this big secret off my chest. I no longer have guaranteed employment. I will finally be pursuing my dreams and chasing my true passion. I've shared my intentions with the world and will be held accountable whatever the outcome. I might fail; but I also might fly. Thank you so much for reading this, and for your continued support - it truly means the world to me. I'll be sharing my experience as a full-time blogger, the ups and downs that come along with it, and any tips that I pick up along the way. Stay tuned. As we enter a new year, I feel like I’m being bombarded with messages about fresh starts and how I can become a “new me.” Gym memberships, change your hair, change your life – there is so much focus on starting fresh on the outside that I want to throw something different into the mix; I want the change that we see this new year to be about the inside. Instead of changing into a new me, I want to focus on loving the old me. I want to look in the mirror and instead of noticing anything that needs to change, I want to focus on what I love; what makes me beautiful, what makes me unique and how I am my own kind of wonderful. Feeling beautiful on the inside so that we are kinder to ourselves when looking at our outsides is no easy feat. For me, the way to feel beautiful on the inside is to be comfortable on the outside and feel 100% confident and feminine in what I’m wearing – right down to my underwear. I’m so happy to have found a new line of elegant Wonderbra lingerie; affordable luxury that feels as good as it looks on and has helped take my confidence to a whole new level. This adorable patterned Wonderbra set is essentially me in lingerie; it’s playful and fun while creating a feminine silhouette. Not only is this set gorgeous, but it also has lightweight, breathable mesh cups that help me feel comfortable and confident all day long. The geometric print and shape is what really sold me on this beautiful lingerie set, and it makes me feel so confident and beautiful that I almost feel like it’s a shame to cover up with clothing – it’s meant to be seen! My next choice is this sultry taupe Wonderbra lace set. There is something so feminine about lace and combined with this gorgeous shade of taupe it literally makes me feel like I can conquer the world. I also appreciate the bra’s X-Temp technology, which adapts to your body’s temperature – so key when being comfortable. New year, new me? More like old me, new attitude. I want to focus on the positive, recognize how wonderful my unique self is and hope that this positive energy is infectious. Starting right down to my undies and working outward, I can attest to how amazing the right lingerie can make you feel – I mean, hello I am here posing in my Wonderbra underwear and I couldn’t feel happier! I’m my own kind of wonderful, and this year I encourage you to be your kind of wonderful too. What do you guys think? Are you working on loving yourself this new year? What makes you feel your most confident? Let me know! All photos by the extremely talented Bettina Bogar. The last full-length dress that I wore out in public was my wedding dress. To actually reflect back and realize that in the last three and a half years of parties, weddings, celebrations and galas and think that I've only worn a gown once - when I was a bride - is kind of shocking. What ever happened to dressing up? Toronto is a very casual city. I've gone to events classified as galas, only to be greeted by jeans. Not typically one to rock the boat, knowing that wearing a gown out will probably result in myself being the dressiest person in the venue means that I usually opt for a cocktail dress. So, when I saw this full-length burgundy dress my initial thoughts where "I absolutely love it, but where would I wear it?" As soon as I put the gown on, I was transformed - seriously! I felt so elegant, almost as though I was another person. The gown honestly made me want to drive to the nearest bar, order a dry gin martini, take a sip of said martini and throw it into a nearby fireplace. Wearing a full-length gown changes you and I for one intend to wear more of them. In fact, the dress is currently in for alterations to shorten the hem slightly so that I can wear it to a dinner next week (hashtag short people problems.) Maybe I'll be the dressiest person there, maybe not - either way, I'll feel fabulous and isn't that what an evening out is all about? Now, someone get me a martini! What do you think? Do you enjoy dressing up, or do you live in a casual city as well? Let me know! Lately I've been having a love affair with glasses. Granted I have a very small prescription so my love stems mostly from vanity rather than practicality, but I don't even care - glasses are one of the most fun accessories out there! 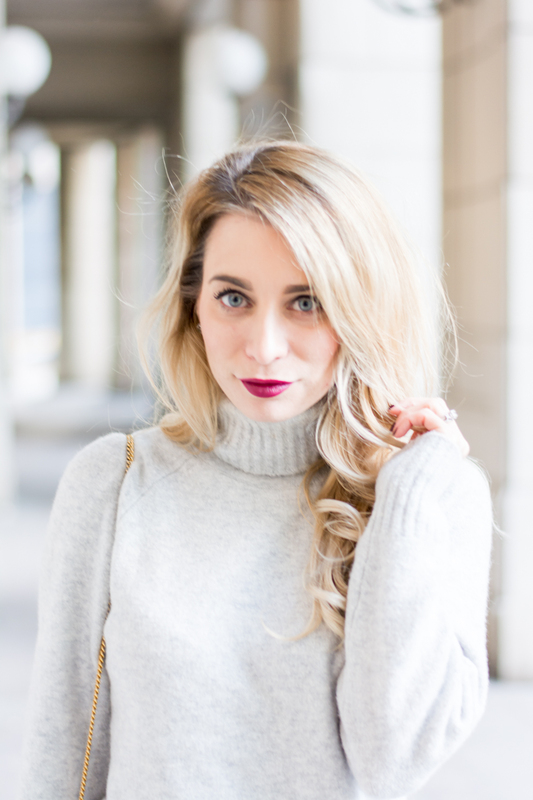 I love how a different frame can completely transform your look and the variety is endless. As last year came to a close, I realized that I hadn't yet used my optical benefits from my health plan at work so off to the mall I went in search of frames! These light-coloured tortoise shell glasses from BonLook really stood out to me; the colours in the tortoise print are very unique and the large shape helps to make them look interesting. The fact that BonLook is a Canadian company is a huge bonus to me - it's so important to support Canadian businesses! All in all, I'm happy with my new glasses and can definitely see myself having fun with different eyewear in the future. What do you guys think? Do you have fun with your eyewear too, or is wearing glasses more of a nuisance for you? Let me know! The new year is in full swing, and I can't believe that we're already in the middle of January! This month has been pretty incredible for me already and while I normally wait until the end to share my monthly favourites, I just couldn't resist to do so now - there's just so much great stuff! So, without further ado here is what I have been absolutely loving lately. I shared in my yearly roundup that travel was going to be a priority for me this year, so I've been on the hunt for the best gear. 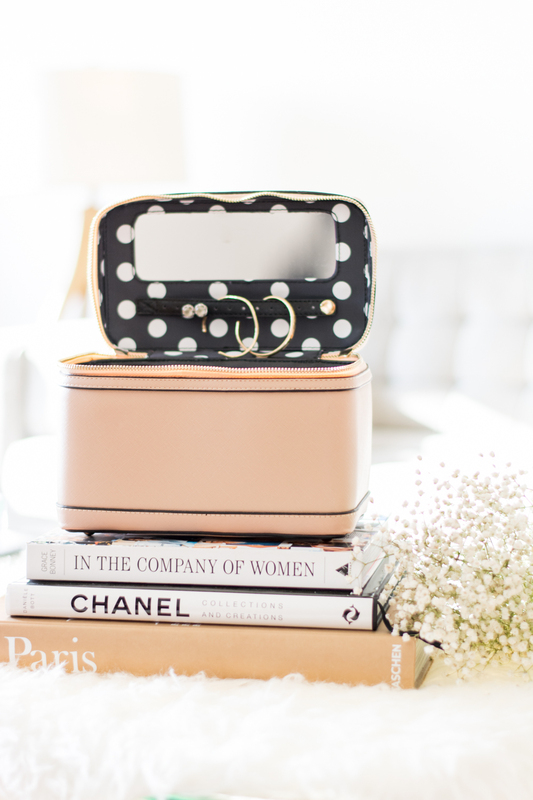 I love this hard-cover travel case from Poppy & Peonies for it's practicality; the inside is made of a wirable canvas, there's lots of pockets and compartments to store cosmetics as well as jewelry, and it's hard exterior protests the precious cargo inside - I absolutely hate getting to a destination only to find my bronzer shattered! Bonus points for the pretty design; practical and pretty - my favourite! Going back a few months, I was on the hunt for the perfect pink coat. While many coats came close, I couldn't find one in the perfect dusty rose colour that would also be warm enough to wear in the winter. 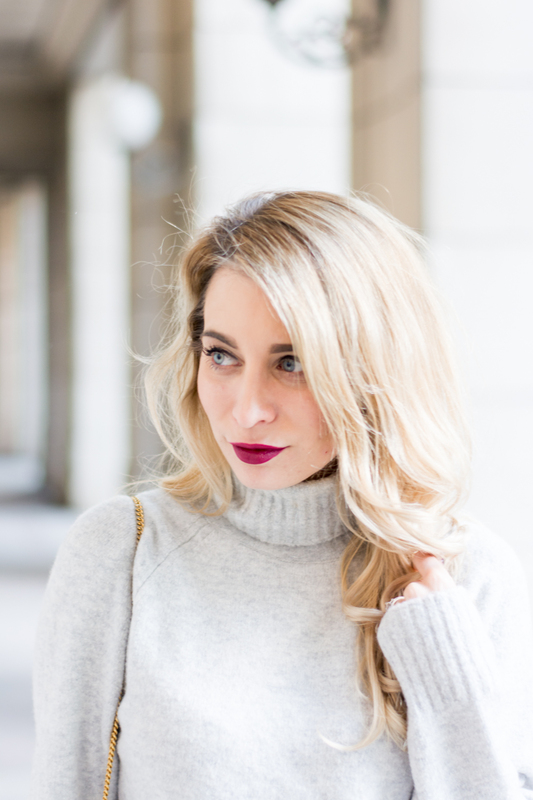 Enter the Reiss Forbes coat - I think I'm in love! Not only is this coat the perfect shade of pink that I had been searching for, but it's also surprisingly warm while being fairly thin - probably because it's made wool. The darker colour makes me less paranoid as I splash through the snowy city with a cup of take-out coffee, and I love the wrap-around look. Overall, I'm very happy and it just goes to show that good things comes to those who wait. 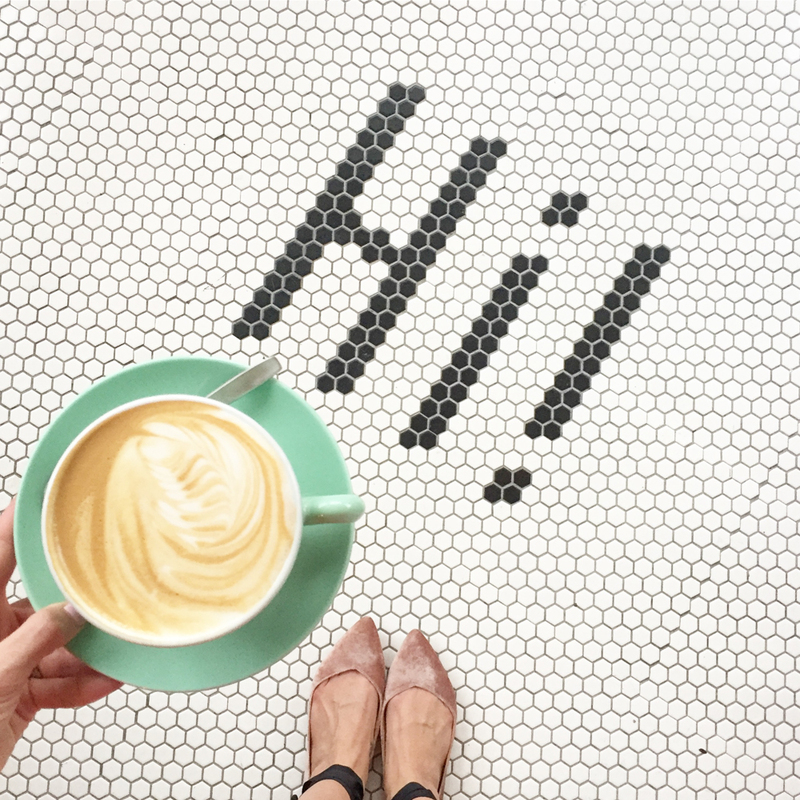 If you follow me on Instagram, you would have noticed an abundance of coffee photos taken over top of perfect white tile. All of the photos are taken at Hailed Coffee and it's not an insta-illusion, I'm actually obsessed with the beautiful café! The lattes are delicious, they offer non-dairy options for milk, they do matcha lattes (!!) and the staff is incredibly nice and welcoming. If you're in Toronto or the surrounding areas, I highly encourage you to give Hailed Coffee a visit - 801 Gerrard St. East. I'm not someone who has a lot of variety when it comes to her day-to-day looks; I usually just find a combination and stick with it for a few months. While the last few months I've been stuck on midi skirts and sweaters, now I've been favouring mini dresses and over-the-knee boots. I just love the effortless look and subtle retro vibes of a shorter hemline and high boots. While I'm on the hunt for more mini dresses, I've been wearing my Le Chateau italian-made suede boots nonstop - they're so comfortable! Expect to see more of this variation in future outfit posts on the blog. That's it for my favourites as of late! What have you been into for the start of 2017? Let me know! I said it once, I'll say it again - just because it's winter, doesn't mean that I'm giving up my skirts! 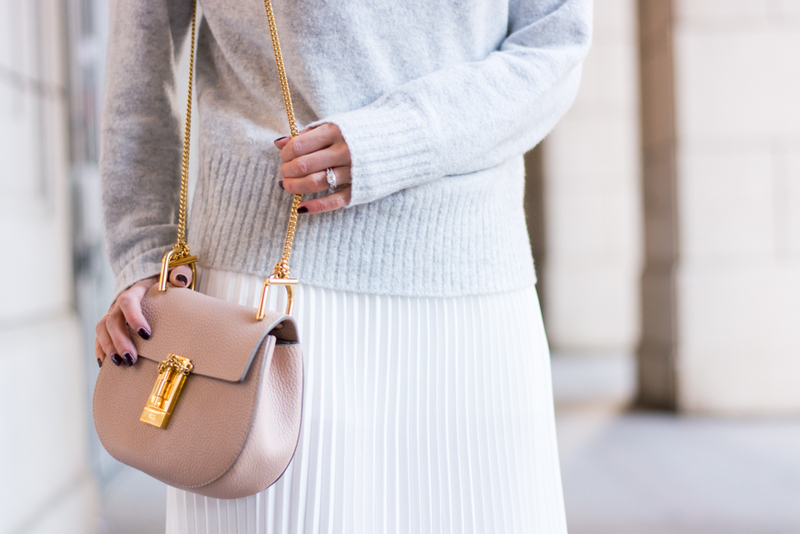 This white pleated skirt from Aritzia is no exception, even in the winter time. You guys know all too well about my love affair with pleated skirts and Aritzia, in my opinion, makes the most beautiful and flowiest ones. Pair your skirts with a thigh sweater and some fun booties and it makes the look a bit more winter appropriate. Hey, you never know - maybe dressing in skirts and light colors will bring on an early spring! Wishful thinking. What do you guys think? Do you wear skirts in the winter too, or am I just crazy? Let me know!